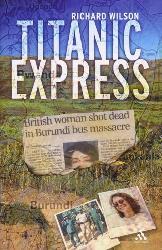 Charlotte Wilson, a British citizen, was killed in a bus massacre in Burundi on December 28th 2000. It was one of many brutal ethnic attacks by the Hutu-extremist “Forces Nationales de Liberation” (FNL). Despite repeated promises, the Burundian government has made no serious effort to investigate the killings, or prosecute those responsible. On the 10th anniversary of Charlotte’s death, her family are urging the UK government to press Burundi to keep its promises, and bring the perpetrators of this massacre to justice. If you have thirty seconds – please show your support by joining the Justice For Charlotte Facebook group. If you have five minutes -please contact your MP via this website, asking them to raise Charlotte Wilson’s case with the UK Foreign Office. Charlotte’s family are asking the UK government to press the Burundian President, Pierre Nkurunziza, to fulfil his longstanding promise to set up a special UN-backed court to investigate the many abuses committed during the country’s long civil war, and prosecute the worst offenders. Human rights experts argue that this approach offers the best hope of achieving both justice and peace in this troubled country. Charlotte’s family believe that the establishment of this special court will be a major step towards justice for the victims of the December 28th 2000 “Titanic Express” bus massacre. If you have ten minutes – please Fax a or post a letter to Burundi’s President, Pierre Nkurunziza urging him to release the journalist Jean-Claude Kavumbagu. Tragically, while the war criminals remain free, one of the Burundian journalists who has done most to highlight the Titanic Express massacre, Jean-Claude Kavumbagu, has been languishing in prison since July. He is facing a criminal trial for “defamation” and “treason” after making critical comments about Burundi’s army. reminding the authorities that, as a state party to the African Charter of Human and Peoples’ Rights and the International Covenant on Civil and Political Rights, Burundi is obliged to uphold the right to freedom of expression.